Our New Zealand friends are understandably unimpressed by jokes and innuendo relating to their large sheep population, although they do tend to give as good as they get! However, it is difficult to resist some passing comment in this case, which involves a request to amend a patent specification that has been under opposition (by up to four parties) for 15 years, after being initially advertised as accepted on 28 March 1995. Furthermore, the application was filed as a divisional of a patent that was subject to litigation which was ultimately appealed all the way to the Privy Council in London. And what could be the subject matter of patents of such vital importance that they would justify this level of persistence and expense? 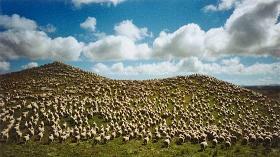 The answer – sheep drench. More specifically, "pharmaceutical compositions for the treatment of helminthiasis in warm-blooded animals, more particularly cattle, sheep, goats, and other domesticated herbivores." We are not sure that pharmaceutical compositions for the treatment of humans merit this level of attention in the land of the long white cloud. Lucky sheep! reference to an earlier application, such as a provisional application or divisional parent from which priority is claimed, is not in itself effective to incorporate the contents of the earlier specification, and may not be used as a basis to add deleted matter back into the later application. We have recently written (eg here and here) about the requirements for allowable post-acceptance amendments in Australia. After the acceptance of a complete specification, no amendment thereof shall be effected except by way of disclaimer, correction, or explanation, and no amendment shall be allowed, except for the purpose of correcting an obvious mistake, the effect of which would be that the specification would claim or describe matter not in substance disclosed before the amendment, or that any claim of the specification as amended would not fall wholly with in the scope of a claim of the specification before the amendment. Thus, in common with the Australian law, amendments may not generally broaden the scope of the claims, with the exception of amendments effected for the purpose of correcting an "obvious mistake". However, the New Zealand law does not extend this privilege to correction of "clerical errors" (although there is some additional provision for correction of certain errors in section 88 of the Act). Furthermore, while the Australian law does not limit the reasons for which an amendment might be effected, the New Zealand law provides that only amendments falling within the categories of "disclaimer", "correction", or "explanation" may be allowed. While this would seem to cover most legitimate possibilities, naturally a body of case law has developed around exactly what the terms encompass. Unsurprisingly, for a dispute that has been running for over 15 years, there is a great deal of background to this case. However, it will suffice for our purposes to summarise only a small part of this. Merial Limited ("Merial") is the applicant of patent application no. 247278 ("the application"), which was filed as a divisional of Merial's earlier patent application no. 237086, which became patent no. 237086 ("the parent patent"). A veterinary anthelmintic drench comprising a suspension of an effective amount of the anthelmintic praziquantel in a liquid carrier, wherein the praziquantel is in concentrations of from 0.15 to 15% w/v. Notably, this claim does not exclude the possibility that the drench may include other anthelmintics. Four parties opposed the application. Ultimately Merial reached settlement agreements with all of them, and the oppositions were withdrawn. In the meantime (and presumably contributing to the drawn-out opposition proceedings) the parent patent was subject to litigation which was only finally laid to rest when the Privy Council (at the time the highest court of appeal, before the establishment of the Supreme Court of New Zealand) affirmed a ruling that the claims of the parent patent were invalid for lack of novelty and/or inventive step. However, before the final opposition was withdrawn, Merial had submitted an amendment request, in the form of 25 proposed replacement claims. The New Zealand Patent Office nonetheless issued a decision on the opposition, on the assumption that the amendment request had been rendered moot by the withdrawal of all opponents. Merial subsequently advised that it had wished the amendments to be considered despite the withdrawals. The Patent Office has therefore set aside the opposition decision, and has now issued the present decision on the amendment request. A method of treating or preventing helminthiasis in lambs, by administering to lambs a drench which prevents or controls the cestodes Moniezia Expansa, said drench containing at least a suspension of an effective amount of the anthelmintic praziquantel in a carrier including water and one or more surfactants, stabilizers and thickeners, wherein the praziquantel is in concentrations of from 0.15 to 15%w/v of the drench and is present in the amount of from 2 to 10mg/kg of body weight of the lambs. This claim is more specific than the original claims, in that it is particularly limited to the treatment of lambs for the parasite Moniezia Expansa, it defines particular constituents of the liquid carrier, and it specifies a particular dosage range relative to the body weight of the lambs. All of the further proposed claims 5 to 25 recite, in one form or another, "the inclusion of an effective amount of at least one other anthelmintic in the drench." Claims 5 to 11, notably, are dependent upon claims 1 to 4, and are therefore, by definition, within the scope of claim 1. The remaining proposed claims 12 to 25 all refer to "a stable veterinary liquid anthelmintic drench when registered as an animal remedy or veterinary medicine," either explicitly or by way of dependency. These would also appear to be further narrowing limitations. I also note that the proposed claims in the present case find their parallel in the claims that had been proposed for NZ 237086 and that were pursued as far as the Privy Council. I think it would have been equally possible for the applicant to have filed the present set of amendment proposals in relation to that patent. It seems to me that, as for the amendments the patentee did file unsuccessfully for NZ 237086, the same fate would have befallen the present proposals. Further, in this respect, since that patent has been revoked, I do not think I can allow amendments to be made to the present application when very similar amendments have been rejected by the Privy Council. It seems to me that I would be allowing to proceed to acceptance, by way of the present divisional, an invention that has already been revoked by Court Order, and I do not think that I can or should do this. One problem for me is not to set a precedent by which others may use the decision to improve an accepted claimed invention to gain enhancements for their claimed invention by inserting specific arrangements within the overall scope of the accepted claims, which specific arrangements were not clearly shown to have been envisaged as part of the invention claimed at acceptance. I should therefore only allow amendments where there is no doubt that they meet the conditions of section 40(1). The suggestion here seems to be that an applicant might seek to effect an amendment that, while strictly within the scope of the accepted claims, nonetheless changes the "nature" of the invention in some way. In this case, for example, an explicit claim to a combination of praziquantel with one or more additional anthelmintics is, in some sense, a "different" invention to the use of praziquantel in a solution in which an additional anthelmintic is not specified, and therefore may or may not be present. In this case, in particular, the "combination invention" had already been the subject of the revoked parent patent. The Assistant Commissioner was therefore understandably reluctant to risk effectively "reinstating" the revoked claims. The proposed claims are quite different from the claims of application 247278 at acceptance. Using the words of Morris J [in the original High Court decision on the parent patent] ... I think that the amendments would effectively grant a patent strikingly different or materially different to that originally claimed. I think that the skilled reader would understand the wording used in the unamended claims, would understand the scope of those claims, and would understand that no correction or explanation is necessary. Nothing in the claims at acceptance contains any matter that requires correction or explanation. Therefore, I do not regard any of the amendment proposals as being by way of correction or explanation. On the face of it, all of the proposed claims would appear to be technically narrower in scope than the accepted claims. However, the Assistant Commissioner found that the claims explicitly reciting the use of one or more anthelmintics, additional to praziquantel, were not within the scope of the accepted claims, stating (at ) that "[t]he claims of the present application, unamended, cannot be changed now to include the presence of other anthelmintics." The general list of anthelmintics in the proposed claims are said, at page 4 of the present specification, to be ‘as claimed in our NZ patent 237086 from which this application was divided’. The specification does not list the anthelmintics but merely draws the readers attention to their presence in the claims of NZ 237086. The reader may or may not necessarily refer to the parent and hence the other anthelmintics cannot be in substance disclosed. The specification of application 247278, like any other patent specification, must be complete in itself. It cannot be the case that whether or not something is disclosed in the specification will have to depend on whether or not the skilled reader goes to and reads that external source. The applicant appeared only to be interested in compositions of praziquantel for the purposes of this divisional. The characteristic of a "stable" veterinary liquid anthelmintic drench, and the limitation of being "registered as an animal remedy or veterinary medicine" were also found to lack basis in the specification as accepted (at -). The Assistant Commissioner ultimately found that proposed claims 1-4 (relating to praziquantel without reference to other anthelmintics) satisfied the requirements of subsection 40(1), but that proposed claims 5 to 25 were not allowable. NOT THE END OF THE STORY? It would appear from the Courts’ decisions, including the Privy Council decision, that the subject matter of all of the proposed claims, claims 1 to 25, would appear to be known or obvious at the priority date. The earlier opposition decision having been set aside, it seems likely that the substantive issues of novelty and inventive step will be reconsidered in respect of the replacement claims, in view of the prior art and other evidence arising in the litigation of the parent patent. Merial's war of attrition to secure grant of a patent on the application may yet be far from over. An adverse decision by the Patent Office would be subject to appeal to the High Court!